A couple of days ago, I went out on a limb with perhaps my most morbid post yet. I worried about offending someone who had lost a loved one to lymphoma. I also worried (just a little bit) that a reader might overlook the quotation marks around “kill” and call the authorities. As it turns out, my fears were unfounded. I’ve received some very supportive comments (thank you, on behalf of my friend Laurice). No one has—yet—called the authorities. And I’ve received my very first fan art, ever. I think Craig may have a bright future in either forensics or book-cover design. And I think I may have at least one mystery novel in my immediate future. As for my dear friend Laurice … I hope that she’ll soon get her wish of appearing as a corpse on Dexter. I start my letter-writing campaign this weekend. Wish us luck! 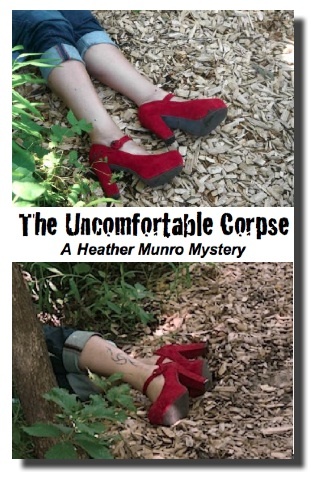 Neat book cover .. although maybe red stilettoes might be more of Dexter murderers style ? “You think he moved the body?” asked Detective Marino, the homicide detective to whom the case was assigned. Ha, ha! Love the narrative! Just as I loved my colleague’s comment, “Maybe she had restless leg syndrome.” Grin.